When you code scan something, it adds a page to the book that describes the object and shows its “codes”. Codes are blocks of different shapes and sizes that represent various qualities, such as Fire, Snake, or Justice. The codes are arranged on a grid (the “mental map”), and you can “rewrite” the codes by swapping them around. The Sword page and the 4 hot-swap code slots. You’ll find item bases scattered through the game, and you modify them by swapping codes. 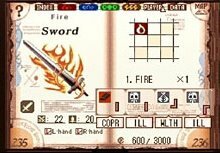 The above picture shows the Sword base with one Fire code, making it a “Fire Sword”. There are also recipes for specific items, e.g. the set of codes you’ll need to make the Sword into a “Champion Gladius”.